Support HD resolution,super clear picture,fast transmission speed,resolutions up to 1920x1080 60Hz(Max)(1080p Full HD) including 720p and 1600x1200,perfect for projector,HD video in large screen,home-theater entertainment,high-end monitoring equipment,office projection. Widely compatible - HDMI to VGA converter compatible with computer,pc,desktop,PS3,Xbox,laptop or other devices with HDMI port to a monitor/projector/HDTV VGA-IN or other devices with VGA port. Gold-plated HDMI port for optimal conductivity connectors improve the signal transmission performance,wear and corrosion resistance to ensure a long lifespan. 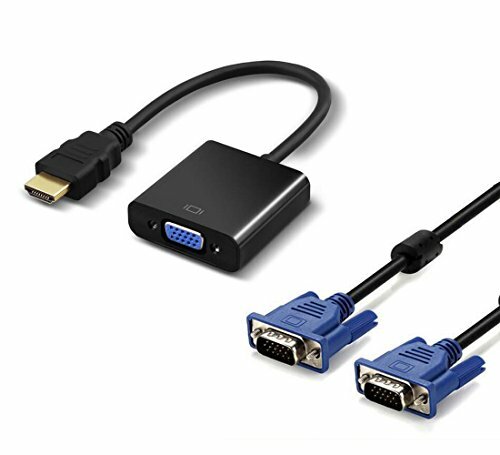 Plug and Play,simple operation connects device converts HDMI digital signal into VGA analog signal(HDMI TO VGA,VGA CABLE INCLUDE),This is not a bi-directional adapter and does not support Audio port. 100% MONEY BACK Warranty:30 days unconditional refund guarantee,12-month warranty and friendly customer service,you can get replacement or FULL REFUND. If you have any questions about this product by Fylam, contact us by completing and submitting the form below. If you are looking for a specif part number, please include it with your message.